Increasingly, employers today are using a tough new kind of interview to evaluate candidates and determine how well they think on their feet. To be successful in these new competency-based interviews, job seekers must be prepared with situation-specific examples that highlight the accomplishments, knowledge, and abilities they have that employers need. 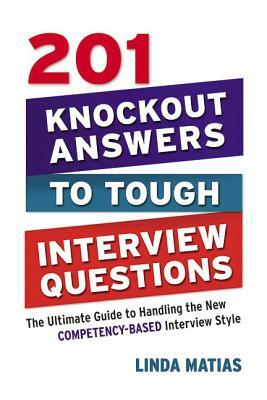 Featuring a plethora of sample questions-and winning answers-this book is organized by the five core competencies most interviewers are looking for: * Individual responsibility (decisiveness, independence, flexibility, career goals) * Managerial skills (leadership, delegation, strategic planning) * Motivational factors (ambition, initiative) * Analytical skills (problem solving, attention to detail) * People skills (teamwork, communication, customer service) This indispensable guide features fill-in-the-blank exercises readers can use to prepare themselves to demonstrate sought-after competencies and wow potential employers. It's a powerful book no job seeker should be without. LINDA MATIAS, JCTC, CIC, NCRW (Long Island, NY) runs CareerStrides, a career consulting firm. She coaches clients on effective interview techniques. A former president of the National Resume Writers Association, her syndicated column appears on sites including CareerKnowHow.com, JobSeekerAdvice.com, and others. She also writes a column and produces a podcast for the YouTube channel CareerStrides and is the author of How to Say It(R) Job Interviews.